Chickenpox is a very common disease that typically affects children under the age of 10. Many children will catch it at some point, but that doesn’t stop you from worrying when you wake up one day to find your little one covered in nasty looking spots! In order to deal with the condition as quickly and effectively as possible, it helps to have a good understanding of what it is, the symptoms to look out for and the treatment options available. Here you’ll discover everything you need to know about chickenpox and what to do if you suspect your little one has it. 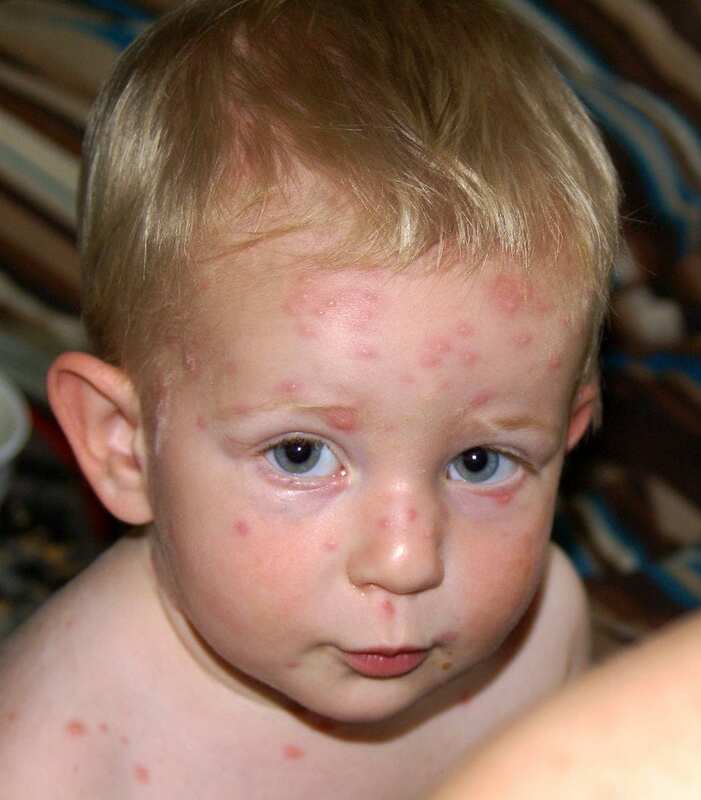 Chickenpox is known medically as varicella. It’s caused by the varicella-zoster virus and is usually a mild, but very contagious virus. However, in some cases it can be more severe and can rarely go on to affect the brain and liver. While this is extremely rare, it is still something you need to be aware of and highlights the importance of getting your little one treated quickly. The good news is, most of the time chickenpox only lasts for around four to seven days. During this time however, they will be able to pass the virus on to other children so you will need to keep them isolated until it disappears. How Did My Little One Catch It? As chickenpox is a virus, to be infected they would have to be in the same room as somebody else who has it. It can be passed on via sneezing, or even just from being close to the person infected. Less common, but still possible, is your baby could catch chickenpox if they come into contact with somebody suffering from shingles. This is because shingles are also caused by the same virus. The above symptoms tend to start a few days before the actual rash appears. The rash itself can range in severity. Some babies develop just a few little spots, whereas others are covered in them from head to toe. It’s always worth taking them to a doctor regardless of how severe the rash looks. The rash also changes pretty quickly. Within just a few hours, the spots blister over. They don’t all appear at the same time either. The rash/spots will usually continue to develop over the course of a few days. While most of the time chickenpox is a very mild infection, it can still cause your little one a lot of distress and discomfort. While there aren’t any actual specific treatments for the condition, there are a few things you can get from the pharmacy that can help. Infant and child Tylenol can really help reduce the flu-like symptoms in the first few days. Always consult a doctor before giving them any medications however as even those designed specifically for babies might not be suitable for your little one. Calamine lotion is also extremely effective at relieving the itchiness caused by the spots. It will cool and soothe the area and is completely safe for your baby’s sensitive skin. The actual blisters themselves should crust over and then fall off within one or two weeks. If My Baby Catches Chickenpox, Will They Get It Again? One of the most common myths you’ll come across regarding chickenpox is that once you’ve had it, you can’t catch it again. In many cases this is true, but it is still possible to develop it again in later life. One man has warned about the risk of re-developing the condition as an adult. After attending a chickenpox party (yes it’s surprisingly a real thing! ), Tom Sykes contracted chickenpox for the second time in his life. The goal of the chickenpox party was to infect other children with the virus in the belief they would get it over and done with. Chickenpox is known to be a lot more severe when it’s contracted later in life. So logically, parents believe if their child develops it early, they’re protected in the long-term. Purposely exposing your little one to chickenpox in this manner in the hope they won’t develop it later on isn’t a good move. It may decrease the chances, but there is a possibility they will still get it again in adulthood. Not to mention, your child’s doctor will have far more safe and effective options to prevent and handle chickenpox. Overall, chickenpox isn’t usually something you need to worry about and thankfully these days it’s a lot less common than it once was. However, if you do suspect your little one has the condition, always consult a doctor. It also helps to keep them off nursery and away from pregnant women and those with a lower immune system until they are no longer contagious. I never knew there’s a chickenpox party, that’s quite weird, but I agree that the younger we get the chickenpox, perhaps the easier it will be. I got mine when I was 11 years old, and I was totally fine. My elder brother got it after me, and he was quite suffering. Nowadays, the babies have chickenpox vaccination. I am not sure if they will still get chickenpox, as I heard some babies still get chickenpox after they got the vaccination. Most parents would agree that it’s better if the child gets chickenpox earlier in life. I guess this is due to the fact that their skin could still change as they grow older, and the scars would eventually be gone. I didn’t get chicken pox when I was a kid. I got it just a few years ago when my two young girls got it. It was terrible! It is, therefore, important to keep a child as comfortable as possible when he/she suffers from chicken pox. Aside from the terrible itch, one would really feel weak because of the high fever. Thank God that my son already had the chickenpox disease. He made fever and a small cold but he didn’t lose its appetite. We had to stay in the house for more than three weeks and take a small treatment. My son was happy because he had to stay home and miss school for more than three weeks! A child would really miss school if he or she has chicken pox because of the terrible itch and overall body weakness the child would feel. The child who had chicken pox is usually also not allowed to go back to school until he/she has healed completely because the disease is highly contagious. I’m just glad that it was summer break when my two youngsters caught the disease. They did not miss any classes. Maybe abroad people don’t get too worried about chicken pox viral disease, because over here in Nigeria, we take it very seriously. Some even still have the spot of the chicken pox all over their skin today. I have actually seen a child that it killed, although before the parent found out it was chicken pox, it’s has taken a huge toll on the baby and the child gave up the ghost. I think I suffered chicken pox when I was 14 years old, I actually contracted it from our neighbors living in the same yard. I normally play with the kids of the family that already had the disease, as a kid I wasn’t aware of anything or its means of transmission. But within a period of time and treatment, I was well again. I have also heard from other parents that chicken pox can be deadly. As per statistics from the Centers for Disease Control and Prevention, approximately 100 to 150 die each year from chicken pox. I would say that is still a big number and could really make any parent paranoid about his/her child’s well-being. I had it just a few years ago. I got it from my kids (I don’t know where they got it from). It’s a very uncomfortable and weakening disease, but if you consult a doctor in time, complications can be prevented. My child did not catch chicken pox. He is 10 months now. Is he at the risk of chicken pox? In the fifth month, my wife developed chicken pox. The doctor said it will pass on in few weeks and don’t need any medical attention. It did pass, however, the condition was painful. Chickenpox in expectant mothers can go bad if it develops in the first or third trimester. This is what the doctor said.